▶ SoldThis listing was sold on Apr 11, 2018 for the price shown here. Stunning 1.5 Sty on double lot! 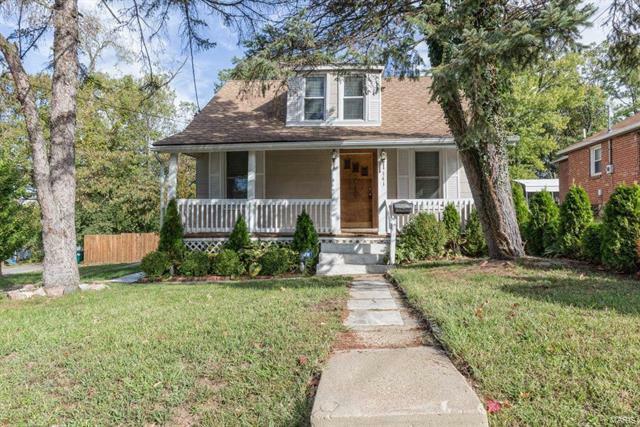 Charming 3 Bd/1 Bth w/1300+ sqft. Newer front porch leads to bright, freshly painted Living Rm. Hardwood flrs, recessed lighting & crown molding carry through to the Dining Rm w/modern chandelier. French Doors open to covered back porch overlooking a great patio & huge fenced yard. Updated Kitchen w/ ample cabinets/countertop space, tile floor/backsplash & SS appliances. Main Flr Master w/sliding barn door, recessed lighting, gleaming wood floors, gorgeous full Bath w/granite top vanity & brushed hardware completes the 1st Flr. 2nd Flr includes 2 Bds w/newer carpeting & plenty of closet/storage space. Highlights: newer roof, double pane windows - extensive renovation 3 years ago! Relax outside on the covered front porch, rear deck, or patio & admire outdoor living space w/6ft privacy fence; built-in fire pit; lush landscaping w/perennials & mature trees. Close to Hwys 40 & 44. Hwy 40 to S McKnight Rd, continue on N Rock Hill Rd, left on Des Peres Ave, right on Almentor Ave, home will be on the left.